Diana Cooper has always had a passion for emerging technology, but it wasn’t until law school that drones really captured her imagination. She was leading a legal session at a drone conference at New York University when she had the opportunity to fly a small unmanned aircraft. “I fell in love with it. 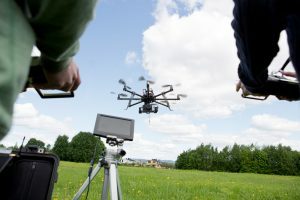 There was so much excitement about the potential of drones at this conference; I realized that drones are a game changer for so many industries and applications helping us move toward a more futuristic world,” Cooper said. 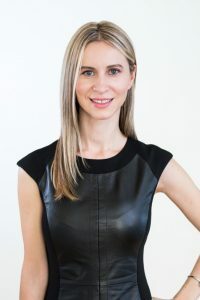 The revelation motivated Diana to develop the very first drone practice at a Canadian law firm – LaBarge Weinstein. There she helped clients navigate the intersection of law and unmanned aircraft systems. Her work quickly established her as one of the most influential and sought after minds in the drone industry. Cooper’s favorite part of her job is developing and implementing policy strategy. She frequently works with the White House to guide initiatives. Under the Obama administration, she helped craft best practices and guidelines around drone privacy. Most recently, she was invited to participate at the White House Emerging Technology Session, convened by President Trump, to highlight the challenges and opportunities in the UAV space. Shortly thereafter, the administration released a memo creating a UAV Integration Pilot Program. PrecisionHawk is partnered with North Carolina Department of Transportation (NCDOT) which was selected as one of the 10 pilot program applications to move forward. Diana will be working with NCDOT and other members of the team to help advance medical deliveries using drones. She also serves on the FAA Drone Advisory Subcommittee, has testified before the Senate Commerce Committee, and regularly briefs the House UAS Caucus on drone policy and regulations. “I get to work with incredibly smart people at PrecisionHawk, on the Hill, at the FAA, and at the White House. We’re all working together to develop a completely new legal framework to advance the safe adoption of drone technology, which is truly exciting,” Cooper said. So what does the future hold for commercial drones? In 2017, Cooper’s role at PrecisionHawk expanded to include leading the Consulting Services for BVLOS and Expanded Drone Operations, where she works with enterprise clients to integrate BVLOS operations. She also serves in leadership roles for several industry organizations. Cooper is the president of the Small UAV Coalition, the top industry advocacy group for companies engaged in commercial operations using small UAVs, and an advisor for the UN Working Group on Legal and Policy Frameworks for Geospatial Information Management, an advisory board member of the Energy Drone Coalition, a member of the Advocacy Committee of AUVSI, a board member of Drone Alliance Europe, and a board member of Unmanned Systems Canada. “A lot of challenges that we’re trying to navigate at PrecisionHawk are common challenges among stakeholders in the industry. I’m passionate about helping the industry advance as a whole - by working collaboratively we can reach meaningful outcomes that benefit us all,” said Cooper.